The connection of the PC-34 cable with the Shugart-50 ribbon cable is made using two clamp bridges and a variety of screw bridges. The following illustration shows only the even signals. All odd signals are ground; DC ground (GND). See also picture 3. In principle, the signal TG43 (TRACK GREATER 43, WRITE CURRENT LOW) also appears on the Shugart 860. The drive is already so new that it also allows internal support via jumper and the external line no. 2 is not needed. But this is not true for all 8" drives. Other drives with an internal TG43 jumper are the Tandon 848-1E and 2E (1983) - please do not confuse it with the 848-1 or 2 (1982) - and the Mitsubishi M2896-63-02M. 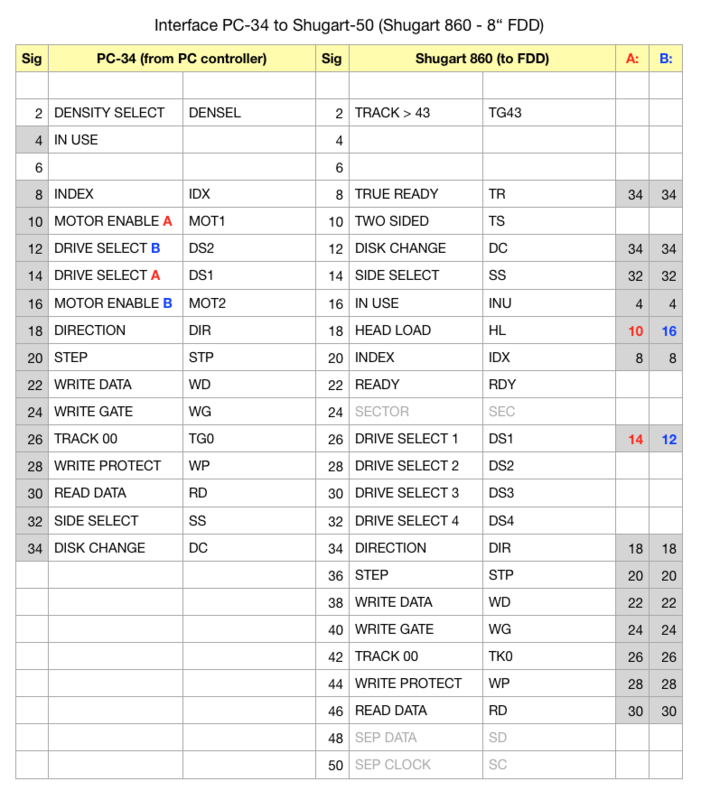 It can be seen in the table that signal 34 (PC-34) is connected to both signal 8 and 12 (Shugart 860). However, this does not work on my Mitsubishi M2896-63-02M. Here is ONLY 34 connected with 12! This is the clear advantage of the screw bridges. The basics for connecting an 8" drive are described here.